Could iTV launch this year? Reports indicate that Sharp will begin sending LCD panels to Foxconn in the year's third quarter to start production on the Apple iTV. According to Chinese news site 21cbh.com, which was translated and summarized by analyst Brian White of Topeka Capital Markets. The Chinese site allegedly spoke with Sharp executives, as well as other sources with the company, that indicated the upcoming LCD TV panel shipments are meant for an Apple television set, often referred to as the iTV among the rumor mill. The deliveries to Foxconn supposedly were originally scheduled for later during the fourth quarter of 2012, but have been pushed up to begin production early. According to White, the bumped up production schedule suggests a 2012 holiday launch for Apple's much talked about iTV. "In our view, a holiday launch would make for a very merry holiday season for Apple and consumers," White said. "However, we will continue to monitor the data points surrounding the timing of this launch as they could change." This is hardly the first rumor tying Sharp to the alleged iTV. Back in March Foxconn bought a 10 percent investment in Sharp, which was followed by Sharp's announcement of 32-inch HI-DPI LCD panels going into production. The iTV is said to run on an Apple A6 processor and feature both Siri and iSight. 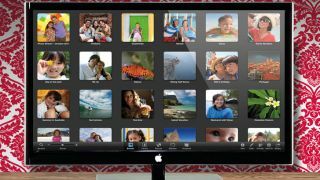 It would also sync with iCloud and enable AirPlay mirroring from a Mac or iPad.